7.1 Do you enjoy reading 35mmc? Shooting film is a challenging process for many new photographers, especially those used to the instant feedback of digital cameras. Modern DSLRs are precision instruments that quite scientifically gather light. Film however is a bit more mysterious. The complete lack of feedback from film, plus multiple film stocks (which all respond differently to light) only adds to the complexity. Additionally, properly exposing color or black and white negative film requires a metering technique that is opposite of exposing a positive image. Permit me to explain. Your camera’s built-in reflective light meter is very accurate. It evaluates the light reflecting from the entire scene with the goal of avoiding overexposure. This is fine for digital, where our goal is avoiding overexposure (blown-out highlights). Your matrix or evaluative meter is also an excellent tool for exposing transparency film. Again, like with pixels, the goal is to avoid overexposure. Properly exposing negative film requires a completely different approach. Whilst negative film has tremendous latitude, proper exposure is still important for consistent results. Rather than using a meter that evaluates the amount of light reflecting from the subject, we need a meter that can measure the brightness of the shadow area in our image. We want to allow enough light to pass through the aperture and shutter of our camera to properly expose for shadows, not the highlights. This allows film density to build and prevents underexposure. Failure to allow enough light to reach the film often results in muddy, underexposed negatives and poor quality prints. Light meters come in many forms, the two most important types being reflected and incident. 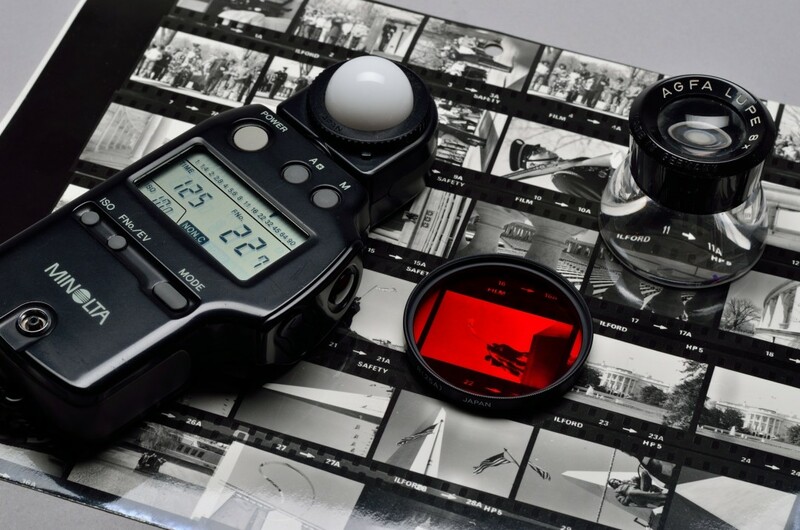 The reflected light meter reads the amount of light bouncing off of your subject. They can be in-camera or handheld. These meters “see” very broadly or very narrowly. Terms like “center-weighted” or “spot meter” help you understand the pattern or angle your reflected meter accepts. However, the reflected handheld meter is similar to your in-camera meter, in that it has no idea what it is looking at, but bases its analysis on returning 18% or middle grey based exposure. Therefore, the photographer must always interpret the reading given by a reflected meter based on what is actually in the picture. Is your subject a bride in front of a wedding cake on a table draped with white cloth? Or is your subject a coal worker, fresh out of a mine, against a dark brick wall? Neither of these subjects is average, and would easily fool an in-camera or reflected handheld meter, causing gross under or over exposure respectively. The incident meter reads the amount of light falling upon the subject. Therefore they are much harder to fool. They may be outfitted with a half-dome spherical sensor or a flat disk. In practice, the dome is more useful for taking a general reading of three-dimensional subject matter, like a face. The flat disk is more useful for flat copy work or by more experienced users for analyzing lighting ratios. For live subject matter lit by ambient light, a single reading with the dome facing the camera will give an accurate reading. Due to the latitude of negative film, there is usually enough exposure with this general reading to develop good film density in shadow areas. So, how do we use an incident light meter? From camera position, if the light falling upon you is the same as your subject, simply hold the meter in front of you with the dome facing the camera. This will yield an average 18% reading regardless of the subject. Is your subject backlit? Is your subject standing on a beach or on a ski slope? No problem. The dome of your meter is reading the amount of light falling upon your subject. Simply transfer the reading to your camera and shoot away. If your subject is in different light than your camera position, the incident meter requires you walk up to your subject and place the meter in the scene. Again, the meter’s dome faces the camera. Be careful not to shade the subject with your body to unduly influence the reading. Have you ever wondered what people are talking about when they say they “rate” their film? In a nutshell, they are using experience to compensate for various factors, often when using a reflected light meter. With a correctly used incident meter, this practice can largely be avoided. The film speed or ISO rating of your film is very scientifically determined by the manufacturer, so by exposing it correctly, its box speed should yield good, consistent results. However, there are many factors that contribute to the density your exposure will yield on your negatives. Rating your film at a speed fractionally slower than box speed (setting your meter for 200 ISO, vs. box speed of 400) takes further advantage of the latitude of negative film and can therefore give a bit of a buffer to help reduce the chance of underexposed areas of a negative. Frame 10 of above contact sheet. In the past, judging film exposure was fairly straight forward. When a contact sheet was made (example pictured at top), one could readily see whether the film density was consistent. In later years, commercial laboratories included back-printing on our paper proofs which included film density. This made it easy for photographers to judge the quality of the decisions we made at the time of exposure (albeit after the fact). Today, most of us rely on commercial scanning to produce our positive film images. We often have no idea how much adjusting was done to create our scans. This can make it difficult to learn from our mistakes and create more satisfying film images. The image above (frame 10 of above contact sheet) was scanned recently on my Pakon F135 Plus. Interestingly this is from a shoot in 1978. 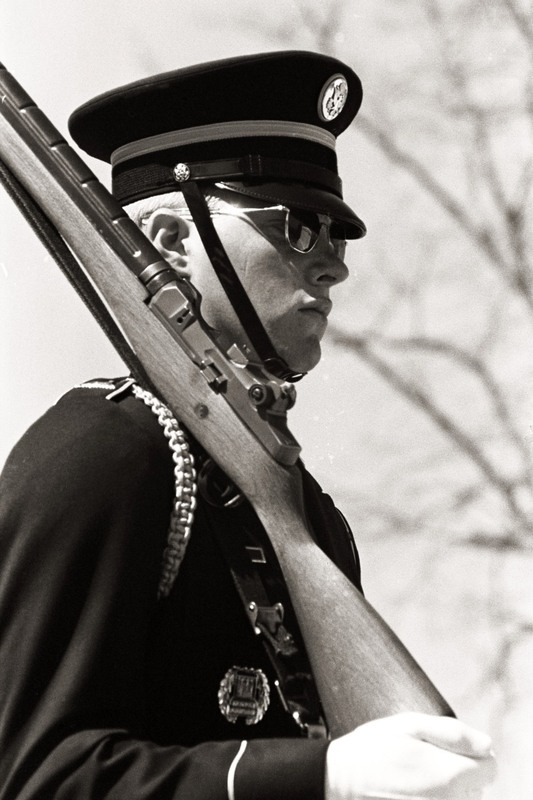 Upon examination, we can see that enough exposure was given to this soldier to develop shadow density and result in very satisfying black tones. If you have your negatives scanned and would like to check your exposure, you can check the density of your negatives by holding them to an even light source. The dense, dark negatives have seen greater exposure whereas the thin, almost transparent negatives have been underexposed. If across relatively similarly lit scenes you are seeing obvious variation in negative density, you might want to hone your metering technique to obtain more consistent exposure from one frame to the next. My suggestion? Buy a proper incident light meter. You should find your exposures nice and consistent, which will lead to an increased enjoyment for shooting film. Now go out there and shoot some film! As a boy, I grew up in the shadow of The Eastman Kodak Company. Photography was always an interest from the first time my father and I developed film and printed it in our basement darkroom. After completing university with a business degree, I pursued commercial photography for over 20 years, during film's heydey. Thanks for posting this John, I think it makes for a very useful and informative post! What about the Lumu light meter device for the iPhone? Any good? I hate lugging around too much stuff and that small device might be ideal as the phone is my permanent companion. Logs the measurements too for later reference…. Wow, just saw the new Lumu Power is 229€…. I’m not gonna play! And it got way bigger. OK, the old smaller one is still available for 149€ not cheap. I can get a good used meter for that money…..
Frank, No. The difficulties expressed here with metering will be faced whichever meter one uses, albeit using an incident, or more properly “highlight” meter will give more consistent results, because most of today’s photographers have never learnt the art to metering and how to properly interpret the readings they are given. In the good old days of film photography, and I am of an age to have enjoyed many decades of it, learning how to use a meter for best results was mandatory. This could only be gained by experience, or more accurately, making mistakes and learning by them. This was especially so with reversal film due to its very narrow exposure latitude, and mistakes here were more costly than with b/w film. Any meter is only as good as the experience of the person using it. The meter is a guide, not a rule. And there is a misconception that using an incident meter is OK for b/w film. If the incident reading is taken as read, this will lead to underexposure, especially noticeable in the shadow detail, or lack of it. The reason is not difficult to understand when one recalls that this type of meter was prevalent in the movie business to avoid overexposing reversal film. At some point, the highlight detail in reversal film will get blown out and these meters were calibrated at this point. Hence their origin as “Highlight Meters”. The shadows were left to go off into black as this was the least worrying aspect. Experienced photographers would therefore make allowances for this when using b/w film by under-rating the ISO setting, thus technically overexposing. But as the meter itself veers to underexposure for b/w film, this re-setting addressed the issue. But by how much was down to the photographer’s own preference and his printing practices. Nice overview. I don’t have a light meter device, but use an iPhone app. So far I seem to get pretty consistent results with it (over a few rolls), do you have experience with that? What would I gain with an external meter compared to an app? The iPhone is a reflected light meter Aukje, so with a separate incedent meter you would gain basically what John describes. The “Lumu” that Frank mentions is a incedent meter for the iPhone. Might be worth a go with…? The app has an incident mode too (using the front camera), but that probably lacks accuracy with respect to a separate meter more than the reflected mode. I have been looking at the Lumu, it definitely looks cute and cool, but I am not sure if it adds a lot since I usually shoot subjects at quite a distance. Or is that an odd/incorrect reasoning? As John said, you don’t have to be near the subject of your photo to use an incident meter. You just have to be in the same lighting conditions! The camera on the front will just be taking a reflected meter facing you I’d have thought. Unless there is a dome or diffuser on the meter to average the light hitting it, it’s not a proper incedent meter. Distance doesn’t really matter. If there is a tree 50 yards away the light falling on it is the same as the light falling on you. Unless the tree is in the shade of a building, in which case you might want to take a reading in that shade. As with any type of light meter reading there is a certain amount of common sense, but the point John is making is that for consistent results, an incedent meter is a very good place to start. I am sorry, just want to add another thing, as I am just now wrapping my head around this and I think I can better explain my confusion. What I understand from this: for film you need good exposure for shadow, therefore an averaged reflective metering is in-addequate (with often large bright areas). But measuring incident light in a shadow area from a distance seems difficult to me, hence the distinction in distance. So with the tree example, the shadow area will be underneath the tree, while I am standing on a distance in an open area, so for correct measurement you should walk to the tree and measure the incident light at that spot? Otherwise I measure for the top of the tree? Let me see if I can break it down a bit further. In very basic terms white things reflect more light than black things. Shine a torch on a white piece of paper and it will glow with the light. Shine the same torch on a black bit of paper and it won’t reflect near as much light. When you point a reflected light meter at either black or white paper the meter doesn’t know it’s looking at black or white, it just understands the level of light being reflected. It is by its nature a dumb thing. It’s only goal is to create an average. White is not average, nor is black. Grey is the average. The result of this is that when the white paper reflects more light it fools the meter. The meter wants everything to be grey/average so it recommends a lower exposure to compensate for this extra light reflected of the white paper. As such it will effectively underexpose the white paper and make it go grey in the resulting photo. The opposite happens with black paper. It doesn’t reflect much light, but since the meter still wants a grey/average outcome it will recommend a higher exposure to compensate. As such it will effectively overexpose the black paper and make it go grey in the resulting photo. In summary, the reflected meter will make both black and white paper expose to a grey. This grey is known as middle grey, or 18% grey. This is the average that all meters are set to give readings to create. The incident meter is no different it still wants an average. The difference is that it is pointed at the light, not the paper. It only sees the light and therefore isn’t impacted in anyway by the subject. It just wants to make a grey/average from the light falling on to it. The result of this is that by using the settings it provides the black paper would look black and the white paper will look white. I’m not sure that’s any clearer…? The point is that in theory, you don’t need to measure that shadow under the tree to get correct exposure, you just need to take a reading of the light falling on the whole scene. Johns point is that film has enough latitude to capture enough detail in that shadow from an indecent reading. After all, in the outcome, you still want the shadow under a tree to be shadow. A reflected meter might get thrown out by the white blossom on the tree or the sun setting directly behind it. Btw, also a little bit thrown off by the Lumu website, who states that reflective measurement is the better choice for landscape and distant subjects. I guess they should read this too! A spot meter and a dose of the zone system goes a long way for creating very good exposure. But of course that’s taking into account a whole other level of understanding… Not to mention the fact that the zone system proper involves print processes too. 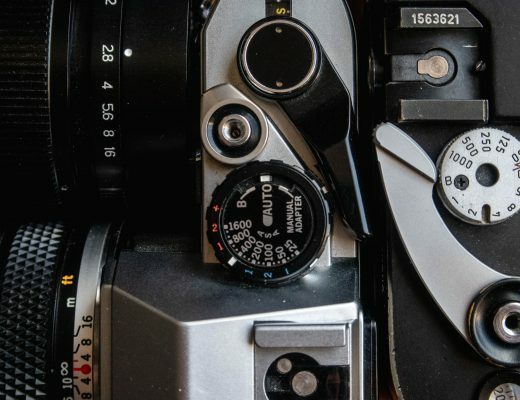 A lot gets said about a lot of different methods of metering, but the point of this post is to highlight a way to achieve good, even and consistent exposure from one frame to the next. Its not the only way, but it is arguably one of the easiest and most reliable ways. Reflected light readings aren’t bad, per se, and there is no reason to believe that they will be “wrong”. They just require more skill on the part of the photographer to interpret the readings to best advantage. It is this that normally leads to imperfect exposures. So unless the subject matter or scene has a predominance of black or white a reflected light reading can usually be relied upon when shooting negative film. The main difficulty is subject lighting and whether this is front lighting, side lighting or back lighting. Reflectance meters work best with front lighting, and more photographer hands on is needed to correctly assess a reading taken in side and/or back lighting situations. For example, if you are photographing a large vase of flowers of a multitude of colours so that white does not predominate, then a close-up reflected reading will work fine. Now if you took an incident reading you would get slight under-exposure as this reading is protecting highlights normally associated with slide (transparency) film. However, this would be corrected when printing, so the slight difference in the negatives is unlikely to be noticed in the print. As has been detailed in this post, a reflected light reading can be influenced by the light reflected from different parts of the subject or scene, (and this is far more important with slide film than with negative film) but an incident meter is immune from this. Here I would like to expand on the advantages of the incident meter reading, especially where being truthful to the original is demanded. Yes, it measures the light falling on, or illuminating, the subject. But this also means that the light falling on each part of the subject matter is uniform and thus each component of the subject as a whole will be rendered in their respective luminance values in relation to each other. So, using the vase example, no one flower can influence the reading by having a stronger reflectance than a neighbour. So in colour work, the reflectance values will all be rendered in proportion to the original subject. It is also useful to remember that some cds meters can be over-sensitive in the longer wave i.e. red spectrum, and can lead to inflated readings where red is present in the subject, thus leading to underexposure. 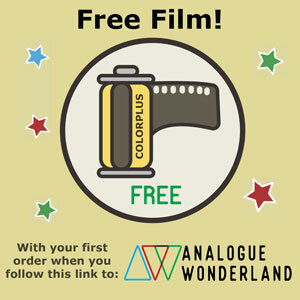 Here is a very good link to a company that should know something about exposing film! Thanks Hamish, that’s an incredibly helpful explanation. From a distance Aukje, you can simply shade the dome with your hand if you are too far away. But honestly, a reading of any landscape scene with dome facing camera would suffice. The need to actually be in shade is not so important. The main difference between reflected metering and incident, is that incident doesn’t care about subject reflectivity. Thanks John. So now what? After 2 disappointing rolls I was getting decent exposure with my app (keep in mind that I have shot less than 20 rolls in total). But I am eager to learn, and want to get it right. Should I get an incident light meter such as the lumu (portability! ), or go for a meter that includes a spot meter? For me, the best choice is an incident meter. A spot meter requires very careful use and interpretation based on a narrow view. The incident meter will give you a consistent 18% middle-gray reading. My feeling is the spot meter can get folks into trouble…fast. Thanks John, will seriously consider that. And read the article you suggested too! This is a really useful posting. Thank you for writing this, John. It may not be obvious, but the “Sunny 16” rule uses your eye as an incident light meter. You judge the lighting on a descriptive scale: sunny (f/16), hazy sun (f/11), overcast (f/8), heavy overcast (f/5.6), open shade or sunset (f/4). As always, you have to use your judgement, for example in early morning or late afternoon, “sunny” is not the same as “sunny” at noon. “Sunny” in December is not the same as “sunny” in June unless you live near the equator. I’ve read that in northern Europe, the rule is Sunny 11. Where I live, we’re at 45 degrees north of the equator (about the same as southern France), so I use Sunny 16 and find it works well. I fully agree with John that an incident light meter is a very useful tool. I find my Sekonic L-478 essential still for assessing indoor lighting with is more like f/1.4 – f/ 2.8 when using a shutter speed that is 1/ISO of the film. Practicing guessing the light and confirming your guess with a light meter is a great exercise for any film photographer. 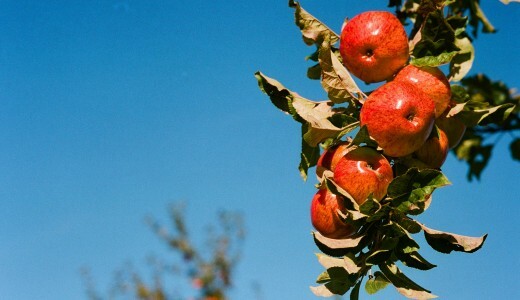 Yes, estimation is a legitimate way to set exposure with film. My main point is that an incident meter is the best tool for beginners as it removes reflectivity from the equation. Thank you for the article. The comments are great too. Any recommendations on a incident light meter model? You are welcome Elias, glad you found it helpful. I haven’t bought one in years but own a Minolta Autometer IV and Gossen Luna Star F2. The most basic incident model will work for this discussion. More advanced models have attachments or features that aren’t required for basic exposure metering. Think about what you need, particularly if you plan to use it for flash photography, including metering light from studio flash units. Once I found out about incident meters I never have gone back. I got a Sekonic 308 which is very small and light and does what it does, simply and easily. They are very cheap and work off one battery that lasts forever. I have the Lumu but the issue is that you ahve to unlock your phone to use it so by the time you ahve mucked around with all that, the Sekonic is out of your pocket and has given you a reading. If I am doing an afternoon photo walk I just take a reading at say f8 and might get 1/500 or 1000th and then set the camera to that for the rest of the afternoon if the light stays the same. No more backlight throwing off the camera meter, you just point, focus and shoot. Great thing about the Sekonic is it does flash readings too – great for testing out things before actually taking a picture. It triggers itself when it picks up the flash going off. It has really helped me with figuring out what to do with bounce flash especially. Thanks for your perspective Rollbahn. The Sekonic L308S-U retails for $199 USD, while the Lumu is $149 (but requires your iPhone). I recently invested in a Pentax Spotmeter V and found prices widely different on the auction sites for working and non-working models. Mine was ca. $60 + postage. Are you planning to do a follow on article about how to use the Pentax spot meter? Not sure if Hamish plans on discussing the technique required for spotmeter use. It is a very precision tool that can lead to good/terrible results. Like a scalpel in the hands of an untrained surgeon, the results can go catastrophically wrong. The heyday of the spotmeter was years ago for large format use. His model in particular was modified for the Zone System, where very meticulous camera setup, metering and development of ONE sheet of film was the intention. With the advent of roll film, many advantages of the Zone System can no longer be gained since we are exposing and developing many images at once. The incident meter is less scalpel, and more hand grenade. It gives us a general 18%, middle-gray reading without concern for subject reflectivity. It still require thoughtful placement of the dome and an understanding of the importance of gaining enough exposure in shadow areas of film. As discussed in my article, this is contrary to exposing for highlights as we do for digital. I hope this article has proven useful to those seeking more consistent film densities. Nice article to read. I started film with my Canon AE-1 and now my main camera doesn’t have a light meter but I don’t see it as a drawback at all. It’s actually a benefit. It feels so free to just look through my viewfinder and see no flashing lights/numbers. I learned sunny 16 and for about a month I would just walk around and guess exposures in my everyday life. I would check myself with my canon ae-1 or phone light meter and that was enough practice. 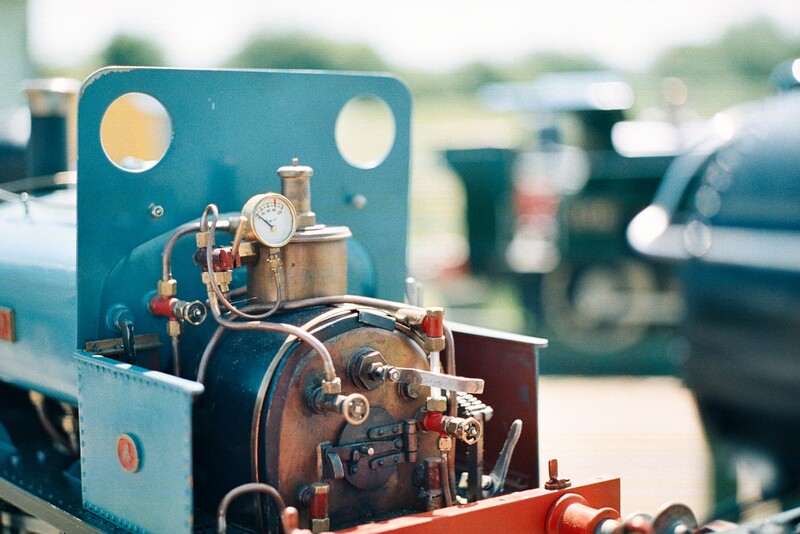 When I finally got my Leica M4-P and shot the first roll and seeing that every shot had been properly exposed…oh man. I felt so happy. Also…nice to see my hometown of Washington D.C. on the contact sheet. Glad you enjoyed the piece Greg. I also shoot an M4-P and occasionally meter. The Sunny F/16 rule indeed works! Thankful for the latitude of film! It’s approximately 18 months since this article was first published, so I feel I should apologise for bringing it back to life so late on. I’m not sure if I’m confused, but I’m surprised to learn that incident light meters are designed to protect the highlights, as stated by Terry B. Because of this, I think he’s saying the incident meter should be overridden to prevent shadows from being under-exposed, eg by using an EI of 200 instead of a box speed 400. My understanding is that light meters designed for photography are calibrated for 18% reflectance, and in the case of an incident meter to recommend an exposure that will be correct for average grey scene. Now if I want to correctly expose the skin of a black person, for example, would it be correct to take an incident reading pointing the meter to the camera and set the value, or should I override the incident reading by under exposing by 1 + 1/2 stops or 2 stops so the film correctly renders the dark skin? And where does the EI override compared to box speed, mentioned above, fit with this, ie incident light meters being designed to protect highlights for the benefit of reversal cinematography? He says that reflected meters are designed to prevent overexposure, rather than incident. Though that does somewhat depend on the meter and how it’s used, the point is, he’s not talking about incident meters in that sentence. There is no need at all to override an incident meter when rating a film at it’s box speed. With an incident meter, it does not matter what colour of skin your subject has. Incident meters read the light falling on the subject. I’m not sure if this clears up the confusion? I use a Leningrad 4 balanced against the Light Meter app on my phone. I have found that the last roll of film I shot – in a 35RC with no battery – the L4 was just as reliable as the phone app. To the extent that I am using just the L4 at the moment and not bothering with my phone. I have not pointed it at myself when metering but feel the next few exposures I will, to have a practical idea of where this is going. Thanks for replying Hamish. I’ve read Terry B’s post again and with reference to incident metering he says: ‘…Now if you took an incident reading you would get slight under-exposure as this reading is protecting highlights normally associated with slide (transparency) film.’ This is where my confusion aros. But reading again, together with your response, I can see a potential path for different interpretation: he’s comparing incident and reflective with reflective protecting highlights. I must say light is a tricky business, and part of the problem is reading the web and getting mis-information. Having an understanding of the zone system helps a lot, btw, you don’t need to read “the negative”, but just get yourself as far as understanding what the middle 6 zones represent, and how to think about them within the scene. That really helped me. I came across a good book by Bahman Farzad, ‘The Confused Photographer’s Guide to On-Camera Spotmetering’. It discusses ‘Normal’ versus ‘Correct’ and ‘Desired’ exposure. Normal being what is recommended by the camera (calibrated for middle grey); Correct being the exposure that produces correctly the image tones in a scene, and Desired that is not necessarily normal or correct, but what the photographer chooses, eg to produce a silhouette. To use a spot meter, or more generally a reflective light meter, in practice all you need are four fingers and a thumb as a guide. The middle finger represents the Normal exposure for middle grey as guided by the light meter, the ring finger and little finger represent -1 and -2 stops respectively, and the index finger and thumb +1 and +2 respectively. So if you point the spot meter at a black cat, say, and expose for ‘Normal’ you will end up with an image of a grey cat. Whilst the zone system goes way beyond the +/- 2 stops of normal, in practice -2 stops from normal (your little finger) will produce an acceptable black cat. Similarly for a white wedding dress, a Normal setting will render a grey wedding dress, but +2 stops (the thumb) will produce a very acceptable white dress. That sounds like a very good book! That is pretty much exactly what I was recommending, but explained in a much more accessible way!! Try it, if in doubt aim for slight over exposure, and I’d bet it will work perfectly! I’m reading The Art of Photography by Bruce Barnbaum (highly recommended), he recommends keeping the exposure within the straight line portion of the curve in order to maximise tonal separations. In short, overexpose by 1 stop, so Zone 3 becomes Zone 4, since Zone 3 which contains dark shadow detail and texture is lifted from the toe of the curve. Of course the effects can be adjusted in post, either during printing or scan-processing. Steve Wales makes an interesting and balanced point about correctly metering for the skin of a black person. I would approach this two ways: first, I would use my Weston Master V in reflected mode, measuring the reflectance of a gray card held near the face, then, after affixing the Invercone Attachment to the meter, I would take an incident reading. If there was any difference, I would use the middle of the two. I began using my Weston again recently after purchasing a Leicaflex SL with a dud meter for a bargain price. Of course, had the meter been working, the only cells available now are 1.5 volts and it needs 1.35 volts for the meter to work properly. So, after using a Nikon F2 Photomic with a good meter for a few years, I’ve dug the Weston and Invercone out of the sideboard drawer. Yes, people stare and probably think: “what’s he doing?” But it would not have seemed odd in the 1950s. Re: Leicaflex SL. Research the Wein cell MRB625 (Replaces PX625/PX13). It works in my SL. 1. Purchase three foam core boards, white gray black. 2. Place all three in the same light. 3. Use either aperture priority or shutter priority, the point the camera’s reflective light meter at each one individually. You will notice a different exposure for each foam core board. If you have a digital camera take a photo of each foam core board. You will notice all three images are gray-ish; you will not see a black white foam core. With an incident meter reading capture an image of all three together, and individualy, you will see a black white and gray card. Unlike the reflective metering the incident meter exposure is the same for each foam core. Why, the incident meter is not influenced by the reflectance of the subject. The incident meter is reading the light falling on those cards, thus the intensity of light remains the same for each card. What you just now viewed is the difference between a reflective meter and incident. You may now understand the saying “a reflective meter can easily be fooled”. 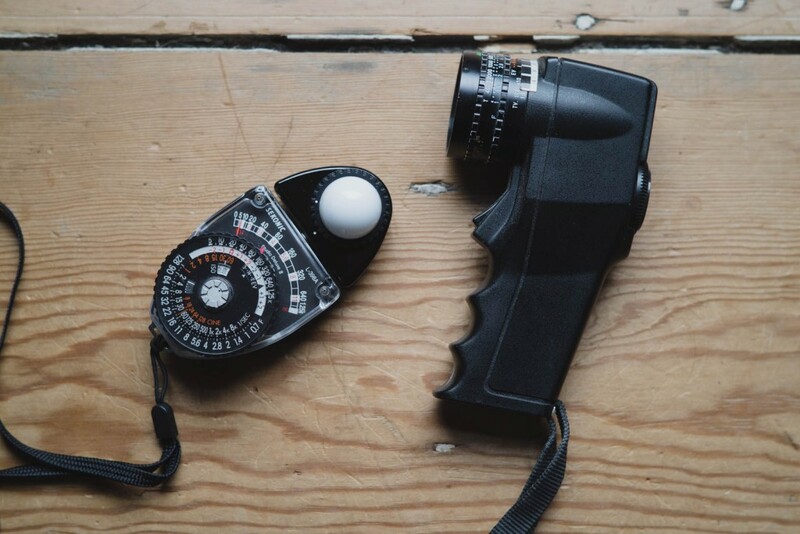 Buy a handheld light meter (Sekonic etc.) with a spot meter binocular. Shoot 400 iso colour negative film @ 200 iso. Meter (w/ light meter in spot meter mode) on the shadows. Take photo. BOOM! Buy a medium format camera. Go shoot weddings. Repeat. You’re welcome. Thanks for your thoughts Joe. This was written for the new film shooter to provide a better understanding of the process. While there are multiple approaches, using a Spotmeter is an advanced skill and requires experience and interpretation (what color is the item you are metering?). It can also lead to wildly inaccurate results if done improperly. Using an incident meter automatically provides a reading of 18% and eliminates variables. Metering in the shadow is ideal and allows one to set their meter at the box speed of the film yielding consistent film density.